Universities, students and staff push back against post-secondary budget cuts. 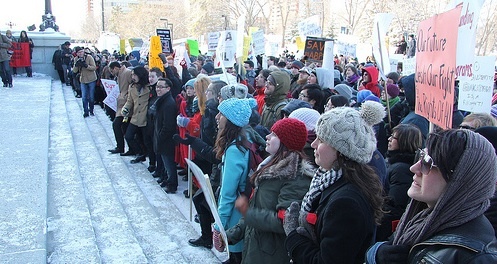 More than 600 students and staff from the University of Alberta rallied against budget cuts in front of the Alberta Legislature. And on that note, Deputy Premier and Advanced Education Minister Thomas Lukaszuk kicked off his overhaul of Alberta’s Post-Secondary Education system. It should be noted that there are only two degree-granting university-level engineering schools in Alberta (some of the smaller universities have transfer programs). Unlike the Deputy Premier, I am not in a position to comment on the mediocrity of Alberta’s engineering schools. After recently returning from a long-scheduled personal trip to Vietnam, the Deputy Premier is faced with an uproar from students, faculty, and school administrations facing the reality of a 7% cut to Alberta’s Advanced Education budget. The budget cuts, along with government plans to harmonize institutional roles, has lead some academics to worry that their autonomy could be put at risk. Last week, more than 600 students and staff marched from the University of Alberta to to the Legislature to rally against the budget cuts. Organizing under the banner of the ‘Coalition for Action on Postsecondary Education‘, or CAPSE, students are planning for actions to protest against the budget cuts. Demonstrating uncharacteristic independence for a group of provincial appointees, the University of Alberta Board of Governors sent an open letter to Premier Alison Redford, warning of the consequences of the cuts. The letter was signed by governors, including board chairman Doug Goss, a former senior Progressive Conservative Party official. “…we must go on the record as being deeply concerned that the recent budget decision of the provincial government to cut the university’s funding by more than seven per cent will have a dramatic effect on the progress that the U of A has made in reaching its potential, both as a research and a teaching institution. This entry was posted in Alberta Politics and tagged Alison Redford, Doug Goss, Thomas Lukaszuk on March 25, 2013 by Dave Cournoyer. Cool! The Board Chair thinks that students are important to the U of A! LOL @ Aden, you and I both know that students, in their eyes, are those brats that stand between a university’s faculty and their research. If University administrations cared about their students, they would have banked a rainy day fund for times like these rather than building monuments to their greatness during the boom. The PC’s did not cut enough. Only the Wildrose will bring these students to their knees and make them pay for their education. I’m fine with these cuts and the related restructuring. Transfer of credits between programs and schools needs to be made easier, no doubt about it. Post-secondary isn’t a right, if the students support all the BS bloat that occurs at U of A and U of C, let them pay the higher tuition for it. We need a more competitive marketplace between the various schools and the more that students have to own the cost of what their schools do behind the scenes, the more we’ll see enrollment increase at nimble, student-focused establishments. That would be a very good thing. Students don’t support the bloat at the universities. Undergraduates are given two seats on the Board of Governors and a small minority on the General Faculties Council, which runs the academic side. The level of critical debate that goes on at the Board is very limited and dominated by the administration. Because it’s the students who suffer most when the university ignores them, give them more power to demand higher quality teaching or at least have the government appoint more critical governors. Poor Joe feels so hard done by. He thinks it’s unfair to expect him to subsidize other peoples’ kids’ education. So let’s make it so he won’t be forced to do that anymore. Of course to be fair to those who did pay to support a student (and the students who payed for their own education), every time Joe or his ilk use anything at all that an engineer or some other professional is liable for, he and his lot will have to pay an additional toll to those of us who did support a student (or to the students who supported themselves). This idea of expectation / mandate letters comes from BC. Oh great Redford is taking ideas from Christy Clark folks. No wonder why this does not make sense. At Athabasca University, the administration has declared financial exigency and announced 44 layoffs. These come on top of 35 people who took a recent buyout offer and 34 empty positions (due to a three-year hiring freeze) that were abolished. About 15 people will be hired in this shuffle. Overall, this mean a loss of about 100 bodies from a full-time complement of 700 (so one in seven). On top of that, the employer wants 10 furlough days (basically you don’t get paid for the days and you can take them off, although you workload won’t go down). I expect the 300-odd part-time instructors (many with decades of service) will get hit shortly with work intensification fueled layoffs via the imposition of a call centre model of teaching. I’m not sure how this is going to create a more innovative PSE system. What will likely happen is a jump in stress leaves, less attention to instruction (as other duties become crushing) and further attrition among those who have options elsewhere (generally younger and more talented staffers). 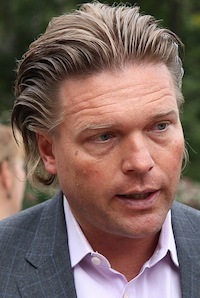 Good job so far Minister Lukaszuk. The whole “let’s just have two great schools instead of five crappy ones” idea would make sense, IF they were actually expanding the two great schools to accomodate all the people you just kicked out of the other three. Joe doesn’t realize that he doesn’t pay for hardly any of the services HE receives in this province… we are in this budget mess because we have been living off resource revenue instead of paying for services we receive through taxes… spending has remained flat when adjusted for inflation and population growth. Sheldon, adjusted for inflation and population growth, spending has increased by a total of $22 billion since 2005. You should write an article about how these cuts to PSE are not a problem of ideology, but rather of simple ignorance. There is a fair amount of evidence suggesting that Lukaszuk has no idea what he’s doing when it comes to PSE. Some of the comments he’s making about PSE to the media are testament to this fact. And, given that the PC party has some history with anti-intellectualism, I’d say it’s safe to attribute these cuts more to ignorance than to ideology. What we need are much deeper cuts. That’s the Wildrose commitment. Check out joealbertan.blogspot.ca. That’s really not accurate. Given that there was $25.8 bn in operating expenses in 2005 and $38 in the 2013 budget, I don’t know where your numbers are coming from. That doesn’t seem like an out of control spending problem to me. You can argue reasonably that our government is spending too much per person, but at least use the right numbers. They’re all easy to find with google and easy to calculate. Aden: It is from a study by Mark Milke. The numbers are the cumulative “extra” money spent over those 8 years above inflation and population growth. Sorry that that wasn’t clear. Lost in this discussion is the attack on the very thing that may sustain our province. If we are interested in having a highly educated workforce we need to put money into the system. The ripple effect of these cuts will be felt for many years. It seems just like the Federal Conservatives the Provincial Conservatives are content to push any people capable of developing an argument that they disagree with their current policies out of this country. Maybe Harper and Redford are closer than what was once thought. Anyone know what the subsidy levels on PSE are these days. When I went it was about 90 per cent subsidized but that was decades ago so I assume the ratio has changed since then. Darren, the U of A’s budget for 2012-13 showed that 45 percent of revenues came from the province and another 10 percent from the feds “and other” governments. At Athabasca University, the provincial contribution is only 30 percent (the province only pays a subsidy for students with AB addresses, though it encourages AU to enrol non-AB students, who are now about 65 percent of the total). So, yes, the extent to which provincial governments are subsidizing the operations of universities have been in free fall, particularly in AB since Ralph Klein came to power. All of these engaging and intellectual discussions are trivial, worthless and a waste of time. Some of you know that….wink wink. The politics in AB are a predictable 4 year cycle. Pre-election promises, post election broken promises, three years of labour bickering, Tories vote out their premier, a new premier gets voted by the Party and he then injects a 4th year of massive cash payouts and raises to healthcare, education and and again, pre-election promises that the Tories need to keep political power. Yes, its roughly the same everywhere, but its far worse in Alberta. The question to ask is the Tory party going to throw out Redfraud and bring in a new Tory leader, and if so, who will it be? Action is the only thing that will break this cycle. It is really quite simple, change your vote, you change Alberta, you will get to change the policies for the better. Everything else is just a distraction and time buying by the Tories before the next election, its just a sham and a drama. Yes, we should ween ourselves of resources revenue by getting rid of waste, progressive taxation and 1 to 2% increase in royalty, so that if its price fluctuates, we have slightly more stable funding from revenues. Bring back health premiums and user fees. Despite these changes, we would still be the best place in the World to do business and execs in Cowtown will still make 2.7 to 2.9 the national average in other provinces. Its all just a game to keep the ill-informed suckers, the uneducated and compliant conformists and unfortunate perpetually behind the 8 ball. Nobody ever gets a chance to touch the bottom of the water they are always paddling water to survive. It really would not take massive changes to life in Alberta to balance the budget. What ‘Political Smokescreens before 2016 Election’ said. Amen.